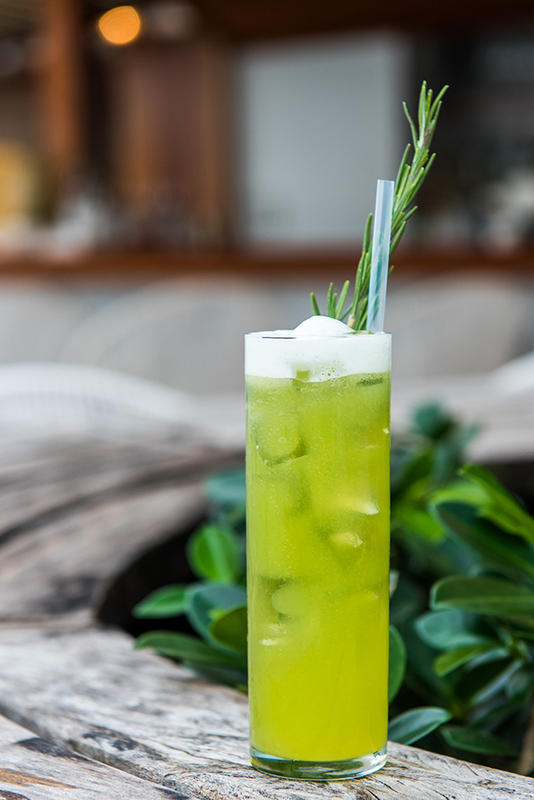 Inspired by the farm-to-table, garden-to-glass ingredients, The Lido Restaurant & Bayside Grill recently started mixing locally grown herbs, fruits, and vegetables with organic liquors and artisan crafted spirits to create refreshing and healthy cocktails. All the ingredients used are fresh pressed and sweetened with cane sugar or organic blue agave. We've also added herbs, spices, and vinegar shrubs to create complexity in flavor. The Lido sources spirits that are made sustainably by companies that strive to reduce their environmental footprint. For example, the Slow Hand white whiskey we use is from Greenbar Collective who plants a tree for every bottle they sell. We don’t mind sharing our secrets with you, so we asked mixologist Amy Demoga for a few seasonal cocktail (and mocktail) recipes for you to try out. Enjoy! A frothy green apple juice with a twist of tart apple shrub (apple cider vinegars, apple cider, sugar cane) makes for a well balanced cocktail that isn't too sweet. The vinegar quenches thirst and cleanses the palate, and doesn't compete with the flavors of food. It's a great aperitif! Shake vigorously- the proteins in the wheatgrass will create a nice froth. Strain over fresh ice. Garnish with fresh rosemary sprig. A surprisingly fresh whiskey cocktail with raspberries and a hint of tarragon. It's solid whiskey base is softened and has an unexpected breath of fresh lemon making it perfect for less experienced whiskey drinkers. Combine 3 tarragon leaves in mixing glass with whiskey, lemon juice and raspberry syrup (do not muddle the tarragon, it should be subtle.) Shake together and strain over ice. Garnish with sprig of tarragon and fresh blackberries. How to make Organic Raspberry Syrup: Soak fresh raspberries in simple syrup and keep refrigerated for 24 hours. Strain fresh fruit once infused. Rose syrup is the hidden ingredient that adds a subtle yet essential layer to enhance the fresh basil. Juicy watermelon and lime is added to create complexity, and when prepared properly this is the perfect well-crafted mocktail. Muddle fresh cut Watermelon and add the Organic Rose Syrup. Add fresh basil and lime juice, then top with Perrier. Shake vigorously. Garnish with a fresh basil leaf and watermelon cubes. Hand pressed lemonade is freshened up by aromatic thyme and a hint of lavender. It's totally refreshing for the non-drinker. Fresh pressed lemonade infused with fresh thyme and organic lavender lemon syrup (royal rose organic syrup.) Mix together lemon juice, lavender syrup and thyme and water. Pour lemonade mixture over glass of shaved ice. Garnish with fresh thyme and lemon wheel. Juice pineapples and green apples. Set aside but reserve about 3 cups of mixture to place in a blender. To this you will add about 8 oz. of whole wheatgrass and leaves of 1 small bunch of mint. Blend juice, wheatgrass and mint. Once a pulp has formed and wheat grass and mint have been pureed pass through a chinos fin. Mix this juice to what you have reserved. Mix thoroughly and consume immediately.